The Bay Area Riders Forum, also known as “BARF,” is owned and run by Dennis “Budman” Kobza, who is a member of the CMSP (California Motorcycle Safety Program) Advisory Committee and also one of the few private citizens on the California Motorcycle Safety Committee. 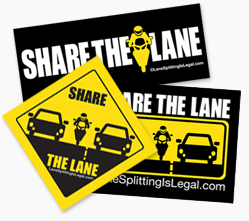 Budman has been a pivotal part of the lane splitting story in California since about 2009, and was first to stand up to an attempt by the DMV to ban lane splitting, leading to the first CHP lane splitting guidelines. You can read more about Budman’s role in California motorcycle safety in the April 2016 issue of CityBike Magazine. Don’t expect to be seen. Lane-splitters are hard to see and some drivers are distracted. and can be deadly in a crash. splitting corridor, it may not end in a crash. harder for them even if a few make it harder for you. Don’t split when traffic is moving at higher speeds. It raises risk but saves little time.